↑ Greek: Τὸ κατὰ Ἰωάννην εὐαγγέλιον, translit. 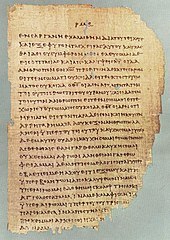 Tò katà Iōánnēn euangélion; an aw cried the Gospel o John, the Fowert Gospel, or semply John. ↑ Burkett 2002, p. 215. This page wis last eeditit on 12 October 2018, at 19:29.